In addition to homegrown veggies (we all know I can't get enough! ), homegrown fruits are also at the top of my list. You might wonder why I bring up fruit trees as one of my favorite things, just as we’re about to enter our winter season. 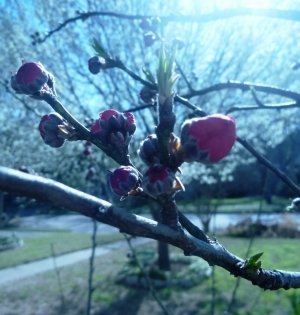 Did you know that one of the best times to plant fruit trees is when they are dormant? While you can plant healthy containerized fruit trees any time of the year, now through February is really best. Also, your selection of fruit trees at the garden center will be most extensive this time of year. Cultivar selection is one of the most important steps you can take when planting fruit trees. The success of many varieties depends on the amount of chilling hours they receive. Stone and pome fruit trees, such as peaches and apples rely on enough chilling for flowers and leaf buds to develop properly. Without sufficient chilling hours in winter to break dormancy once warm temperatures return, trees may experience many different problems that can damage fruit production. A few of my favorite varieties for Texas are ‘Moonglow’ pears, ‘Ranger’ peaches and ‘Methley’ plums, but there are many to choose from. When planting fruit trees make sure to provide them a spot with full sun exposure for best success. By full sun I mean sun for most of the day, if not all day long. Good drainage is also important. Choose a spot in your landscape where you’re sure you don’t collect excess moisture due to drainage or settling issues. Fruit trees will require regular fertilization and treatment programs to maximize production. You’ll need to provide adequate water to your new trees until they become established and supplemental water thereafter as needed. It’s also a great time to plant berries and grape vines. A few to look for include ‘Brazos’ Thornless and ‘Womack’ blackberries. Blackberries are one of the easiest fruits to produce in our Texas soil and climate. You’ll be rewarded with an abundance of fruit with little effort.